Phytomyza spondylii Robineau-Desvoidy, 1851; Spencer, 1972b. Handbk ident. Br. Ins. 10(5g): 8, 71, 74 (fig. 248), 79, 81. Phytomyza spondylii Robineau-Desvoidy, 1851; Spencer, 1976. Fauna ent. Scand. 5(1): 506-8, figs 884-6. Phytomyza spondylii Robineau-Desvoidy, 1851; Spencer, 1990. Host specialization in the World Agromyzidae (Diptera) : 160, 165, 167, 174 (figs 653-4), 175, 177. Leaf-mine: A conspicuous, whitish linear mine. Pupation external (Spencer, 1976: 506, 507 (fig. 886)). Long, upper-surface, frequently branched, little widening corridor; sides somehwat irregular. Often several mines in a leaf. Frass in grains that are placed close together, rarely forming short pearl chains. Pupation outside the mine, exit slit in lower epidermis. Sometime the puparium sticks to the leaf. Feeding punctures in lower epidermis (Bladmineerders van Europa as Phytomyza pastinacae / spondylii). 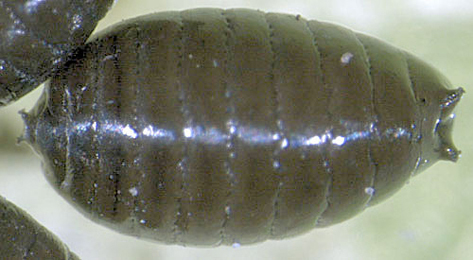 Larva forms a conspicuous, whitish linear mine. Larva leaves the mine through the lower surface and falls from the leaf on pupation (British leafminers). The larva of Phytomyza pastinacae / spondylii is illustrated in Bladmineerders van Europa. Shining black; posterior spiracles each with 16-26 bulbs (Spencer, 1976: 506). The puparium of Phytomyza pastinacae / spondylii is illustrated in Bladmineerders van Europa. Comments: Spencer (1972b: 79) treated pastinacae Hendel as a junior synonym of spondylii Robineau-Desvoidy, although later he treated pastinacae as a distinct species (Spencer, 1990: 175). Both are recorded on Pastinaca and Heracleum in Europe and currently can only be distinguished by the male genitalia. Records on Astrantia in Britain are based on samples from Botanical Gardens. Most British records of both species require confirmation. Host records given in Bladmineerders van Europa include both Phytomyza pastinacae and Phytomyza spondylii. Time of year - mines: May-November. Distribution in Great Britain and Ireland: Widespread and common throughout the British Isles (Spencer, 1972b: 79), Inner Hebrides (Isle of Coll) (Bland, 1992), Warwickshire (Longford) (Robbins, 1991: 67); Anglesey, Ayrshire, Caernarvonshire, Cambridgeshire, Denbighshire, East Gloucestershire, East Kent, East Ross, East Sutherland, Easterness, Fife, Flintshire, Glamorgan, Haddington, Isle of Wight, Leicestershire, Mid-west Yorkshire, Merionethshire, North Somerset, North-east Yorkshire, Outer Hebrides, Pembrokeshire, Shropshire, South Lancashire, South Somerset, South-east Yorkshire, South-west Yorkshire, Stafford, Stirlingshire, Surrey, West Gloucestershire, West Norfolk and West Sutherland (NBN Atlas). Also recorded in the Republic of Ireland (Martinez in Fauna Europaea). See NDBC interactive map. Distribution elsewhere: Widespread in continental Europe including Belgium (de Bruyn and von Tschirnhaus, 1991), Denmark, Finland, Norway, Sweden (Spencer, 1976: 506), The Netherlands (de Meijere, 1924), Luxembourg (Bladmineerders van Europa), Germany (Spencer, 1976: 578), ? Austria, Czech Republic, Hungary, Italian mainland, Lithuania, Portuguese mainland, Romania, Spanish mainland and Switzerland (Martinez in Fauna Europaea). Also recorded in Canada and the U.S.A. (Spencer, 1976: 506).